Plus, the first round of baseball playoffs makes it easy to slip into a hardball trance in front of TBS. I've got to admit, I'm pretty fond of the wild card play-in game; it had more teamsd playing for keeps in September. Of course, I'm also hoping that the nightmare tie scenario comes up, too. I must admit, though, that I'm not having quite so much fun rooting for "not the Yankees" as opposed to the Red Sox. I also headed up to Maine on Sunday; a niece had a birthday, and thus it was necessary to shower her with gifts and eat cake. The amusing bit is that, apparently once a girl turns six, everybody feels the need to get her Legos. Including myself, naturally, although there were conflicted feelings about the Lego Friends sets, which maybe try too hard to appeal to little girls - kind of cute, and still Legos, but verging pretty close to Playmobil territory. Anyway, I lolled around for a bit afterward, long enough to wind up seeing Taken 2 at Boston Common rather than the Capitol. Dagny and I have the same birthday, so I made sure to treat myself as well - the birthday movie was Looper, following dinner at Boston Burger Company. Both, as expected, very good! It's very nice to see that BBC has finally completed the inevitable and needed expansion into the empty space next door, and still makes a darn good burger. I finished just in time to grab a seat for Looper, and I dug it as much as expected. 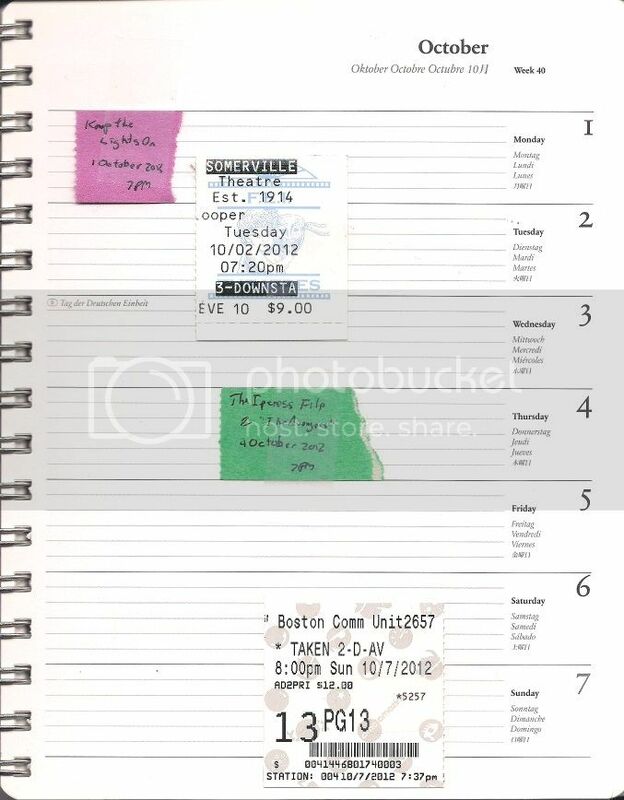 On either side of that, there were shows at the Brattle. The CineCaché program this week was Keep the Lights On, which was a perfectly acceptable indie relationship drama though not really a noteworthy one. It's not a great feeling to say that, because the director was there and it was based on his actual life, but sometimes "based on a true story" just means it's not exceptional. Thursday, meanwhile, was my first sample of their "Cloak & Dagger" program. I loved the main feature of The Ipcress File, and dug the two episodes of The Avengers that they showed, even if the second was a little Steed-heavy (about halfway through the riff on "And Then There Were None", I was grumbling to myself about having been told there would be Diana Rigg). Even with a week to recognize that certain paradoxes keep the plot from having the tight effect-and-cause timeline you might really like to see from a time-travel movie , I still like Looper a whole lot; I'm pretty sure that when all is said and done, it will be one of my favorite movies of the year. Even when it doesn't get its story completely straight, it does well in using time travel to represent cycles that it can be very difficult to escape from. What's perhaps most impressive is the trick it performs with Joseph Gordon-Levitt and Bruce Willis playing the same character separated by thirty years of subjective time. Exaclty what happens is too good to lay out, but what's mos impressive is the way the actors and writer/director Rian Johnson choose to make the character(s) work: Rather than keying on obvious shared mannerisms, scars, and the like, they use just enough makeup to elicit a reaction of "yeah, I can see that" and then make the story run on a much more basic connection, that despite his protestations to the contrary, old Joe is just as selfish as the younger version. There's also a number of other terrific things going on - a future that seems, while not outright dystopian, to be the result of 30+ years of plausible decay, with some cool science-fictional niftiness but not enough to make it really desirable; Jeff Daniels pretty much note-perfect as the guy from the future who probably drew the short straw to be handed this assignment (and maybe being another character's future self, or maybe not); Paul Dano exiting the movie in a pleasantly quick fashion. And while I can't claim to be the hugest fan of any specific thing Emily Blunt does in this movie, it somehow works in the aggregate. It doesn't hurt that she gets a lot of scenes with Pierce Gagnon, who is really a certain kind of terrific as her son, a damaged kid who is remarkably individual in his dysfunction, and somehow sympathetic enough that the audience is able to ignore the implications of everything else that is happening until it slaps the audience in the face in the last act, or, heck, the last minutes. SPOILERS! SERIOUSLY, I'M BREAKING DOWN HOW THE VERY END OF THE MOVIE AFFECTS EVERYTHING ELSE HERE! LOOK AWAY IF YOU HAVE NOT YET SEEN IT! It strikes me, writing this, that what Gagnon and Johnson do is likely close to exactly what we as fans wanted from Jake Lloyd and George Lucas fifteen years ago: He's a figure whose potential to become a monster is unmistakable, even obvious, but makes us wish things could end differently. I think that just how singular this part of the movie turns out to be demonstrates that it's really, really hard. Of course, I'm not sure the existence of the Rainmaker really makes sense; it's maybe the wibbly-wobbliest part of the time travel plot: He seems to arise in a timeline where Old Joe is killed as soon as he arrives in 2044, and thus doesn't kill Sara while trying to kill Cid. Sure, it's quite possible that Sara fails as a parent and Cid is destined to become the Rainmaker no matter what, but I don't think the movie is meant to be taken in quite so cynical a fashion. There are a couple of escape hatches, I suppose, but they're dramatically soft - maybe if it wasn't Joe, some other looper would have killed Sara and set Cid on the bad path, in which case this is only a temporary victory; or perhaps that it wasn't just a matter of saving Sara's life but making her realize exactly what the stakes are, which makes means the whole thing was about moving the needle just a little bit. The whole thing does make me wonder whether Sara's name is a deliberate Terminator homage, though. Most of my other nitpicks are small ones - if the problem in the future is disposing of bodies, why don't the gangs of 2074 just send bodies back in time as opposed to people who could potentially run away? And why do loopers kill themselves? It strikes me that if Old Joe and Old Seth were sent back not to their younger selves, but each other, a lot of headaches could have been avoided. The answer, of course, is "drama", but drama's a pretty terrible way to run an illegal enterprise. I also tend to hate suicide as a resolution - I remember a story from Analog where a situation like the one in the final minutes basically ended with the main character making a decision, although that's not exactly visually exciting. Maybe he could have just blown off his gun hand, though? As you can tell, I liked the heck out of it, and reiterate that it would be listed as one of my favorites of the year if I didn't have the "Making Lists Is Stupid" policy. I do, admittedly, have a "Making Pointless Comparisons Is Stupid But I'll Do It Anyway" policy, and I did find myself kind of wondering why Rian Johnson doesn't get the same amount of love/critical fawning that, say, Wes Anderson does. The likes of Looper and The Brothers Bloom are as visually quirky and weird as anything others do, but it almost seems like he gets penalized, relatively speaking, for first and foremost telling a story and building the off-beat stuff around it.